Like a really big puff pastry moment. I mean, HUGE moment. As in a I-made-four-recipes-in-one-day-with-puff-pastry moment. Couldn’t stop myself. Thankfully I won’t bore you with all of them and you’ll see some in my recipe disasters later this year. Um, later this year as in four months. FOUR MONTHS. What. What is going on? Time, I hate you. Can’t you just slow the heck down? Now I say. 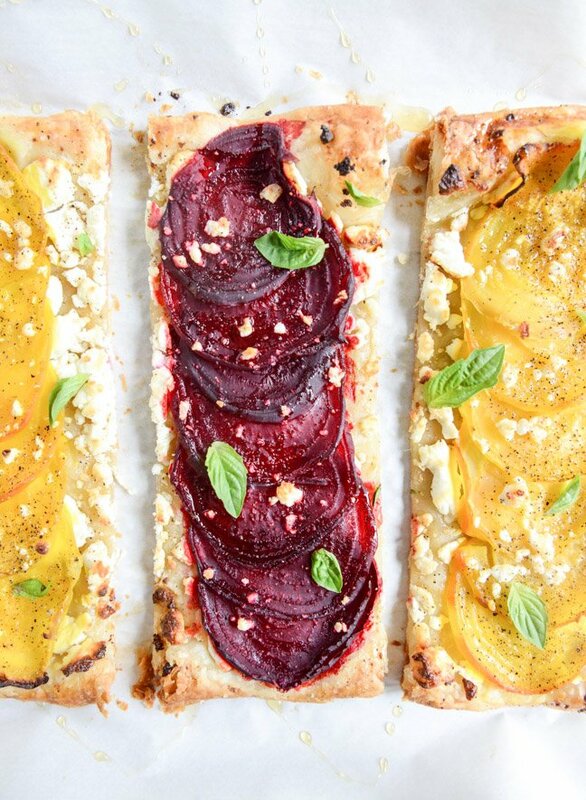 These little tarts were inspired by a recipe in my cookbook – which is a simple roasted beet salad with goat cheese and greens – but one of Eddie’s favorites. He LOVES beets. Goes crazy over them. I can get behind them too, especially when roasted and well, especially when combined with the flakey perfection of puff pastry. GAH. I also threw some goat cheese on the tart underneath the beets and on top, sprinkled with lots of salt and pepper and a heavy handed honey drizzle. Then a few basil leaves for prettiness when finished. These are so freaking simple. The longest part is waiting for the beets to roast and if you want to serve these as an app or for guests, you can totally do that ahead of time. They are such a fun summer snack AND may I add… an awesome way to get people who hate beets to eat beets. Really, who is going to say no to butter-soaked layers of dough? I decorated (read: destroyed) a few gorgeous white cutting boards with these babies too. I want to frame the remnants and accidental art. It’s the most creative I can get – and it’s all by accident. It was like a scene from Dexter, way worse than I ever get with pomegranates. And you can use whatever color of beets you prefer – I just love the contrast of the golden and red slices. Makes it easier on the eyes. Plus, I find that the golden beets taste… something… maybe… milder? Than the red beets. I could definitely be making that up though. I don’t know anything. In the meantime, you can make this giant puffy tart and then slice it into baby tarts and try not to eat a million of them. They are THAT good. Preheat the oven to 425 degrees F. Slice the greens off the beets and scrub the outsides. Rub them down with olive oil then wrap tightly in aluminum foil. Roast for 1 hour, or until tender enough to slice. Unwrap the beets and let cool until they are comfortable to the touch. Once cool, rub the beets to remove the skin. It should peel right off! Using a mandolin or sharp knife, slice the beets into 1/4-inch slices. I like to always start with the golden beet so the color remains and it doesn’t turn red. Place the thawed puff pastry on a baking sheet. Brush it with the beaten egg wash. Take 4 ounces of the goat cheese and spread it evenly over the pastry. Add the sliced beets on top – however you’d like. Season with the salt and pepper and crumble the remaining goat cheese on top. Bake for 25 minutes or until the pastry is puffed and golden. Remove and drizzle the honey over top. Garnish with a few basil leaves. Serve immediately. Did anybody realize there is no baking temperature? there is a baking temperature. it’s the first line of the recipe. Made this for the 6th time today. Yum!! I am the only person who eats beets in my house. More beers for the best eaters! Pingback: Strawberry Season is over! Berries, Brews & BBQ’s ONE more Weekend!! This look really delicious! Can this tart be served the next day and still be good? i wouldn’t serve the next day – the puff pastry really needs to be made right before serving! How would I do this if I use pre-cooked beets? Pingback: Benefits of Beets for a Healthier You. These Recipes Will Convince you!